Something you won’t see in Fiji’s mainstream media … On December 14, 2011, the people of Namosi staged a quiet protest against the proposed mining project on their land at Waisoi. 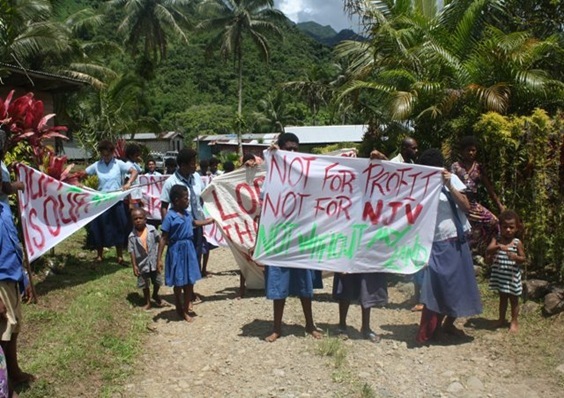 Representatives from Namosi Joint Venture (NJV) [led by Newcrest Mining] turned up for a meeting with the villagers in the area where the landowners are worried about the potential environmental effects and the loss of mataqali (landowning unit) lands. The project is in the environmental impact assessment stage. While the men sat in the hall with representatives of NJV, the women and children sat outside holding banners calling for their land to be left alone. Witnesses say some women where crying as they sat outside. The villagers appear to want the developers to slow down and not make hasty decisions regarding the project, but the regime is keen for companies to start mining. Reports and photographs on the December 14 meeting have been censored by the Fiji government. Justice Sawong, one of the two Supreme Court judges who ten days ago approved the dumping of 100 million tons of toxic waste from the Ramu mine into the sea off the coast of Madang, has a rather strong connection to the contested politics of Papua New Guinea and links to the discredited Somare regime and Chinese miner, MCC. In 2007, Justice Sawong resigned from the judges bench to contest the Kabwum seat in Morobe Province in the National Election. Sawong fought the election as a member of the New Generation Party. Despite the electorate having one of the smallest candidate lists in the election, Sawong finished second to Bob Dadae and after the election he returned to the bench. It will be interesting to see if Sawong again resigns to contest the 2012 election and, if he does, lets keep a close eye on who funds his campaign. 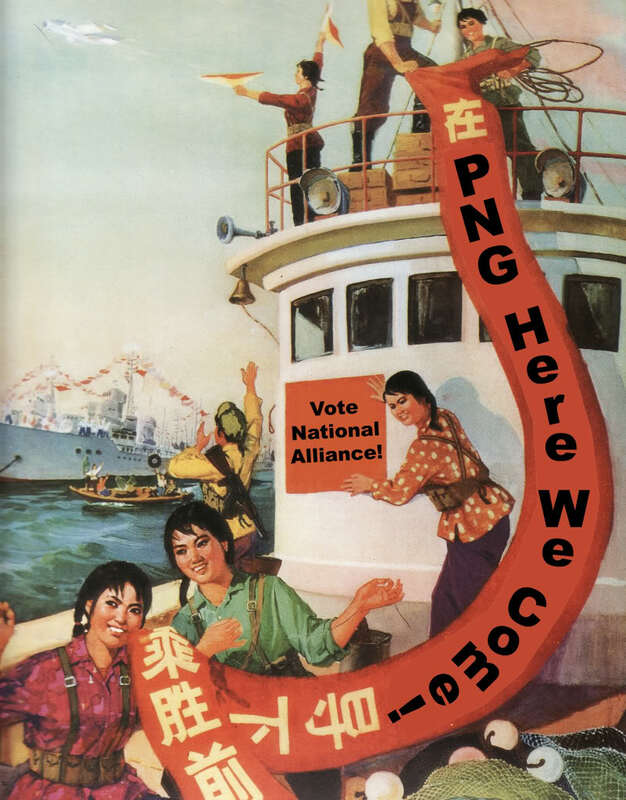 MCC, the Chinese state owned corporation that operates the Ramu mine is known to be an enthusiastic funder of the Somare’s and their National Alliance party, with their strong ‘Look North’ focus. Although Sawong’s New Generation Party is an arch rival to the Somare camp having been set up by Bart Philemon when he broke with Somare, one NGP MP has been a loyal supporter of the NA led government. New Generation Party MP Francis Potape is, according to the Somare camp, the current Energy Minister in the Somare government sworn in by the Governor General on December 14. This is despite Potape having been charged in November with fraud and misappropriation in a case first exposed on the PNGExposed blog in Oct 2010. Lets hope that politics did not sway Justice Sawong’s judgement in the recent case. Proactive Investor is reporting the share price for New Guinea Gold, owner of the Sinivit gold mine in Papua New Guinea, has dropped over 16% as the mine remains closed over a dispute with local landholders. New Guinea Gold Corp said Wednesday that mining and processing at its Mt Sinivit operation in Papua New Guinea has temporarily been halted, sending shares down more than 16 percent. The company said representatives of the Wild Dog Mining Area Landowner Association (WDMALA) and Lulai Nakama Association have occupied the mine-site and forced its temporary closure. All staff have been stood down safely and police presence is being maintained on site, New Guinea added. 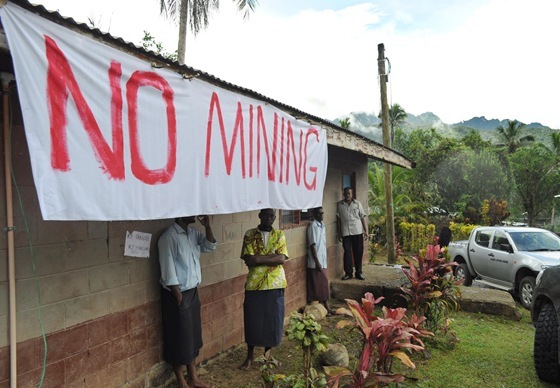 On 12 December 2011, New Guinea received a letter from the landowners’ lawyers demanding that outstanding royalties be paid to the Mineral Resources Authority (MRA) within 48 hours, failing which the landowners would shut down New Guinea’s mining operations. New Guinea said it has been waiting on a Court settlement between the Landowning Clans since early 2010, following instructions from the MRA to pay the royalties to the WDMALA. “Despite assurances and undertakings from NGG that their demand would be met and the funds would be paid to the MRA, the Landowners, following a meeting with the Mine Management on 21st December 2011, occupied the mine site on 22 December 2011,” the company said in a statement. The royalties were released to the MRA the same day, New Guinea added, but the landowners remain in occupation of the site. The company is currently seeking court orders to remove “those persons occupying the mine site illegally” before pursuing a negotiated settlement of landowner grievances. Acting CEO, Greg Heaney, commented: “This is a very disappointing situation and the company was left with little choice but to ensure the safety of its staff and to cease operations until such times as those illegally occupying its mine and associated premises are removed by the lawful authorities. Shares fell more than 16.6 percent Wednesday, to trade at $0.05 as of 3:01pm ET. EAST New Britain Governor Leo Dion has said he was in the dark regarding the operations of the Sinivit Gold Mine and the implementation of the Memorandum of Agreement between the developer, landowners and the provincial government. Mr Dion, in a press statement, said he was concerned that there was lack of consultation by the company officials with his government and administration. “This is what we get when there is lack of or no consultations between the parties concerned,” he said. He said he supported the Uramot Baining landowners but the action taken by the landowners to move into the mine was not the answer to their queries. Mr Dion called on the landowners and New Guinea Gold (NGG) Limited to meet and sort out their differences and if the agreement needed to be re-visited then it must be done for the good of everyone. However, he said if the company was not prepared to meet its obligations then it must be ready to wind up its operations and move out. The company has said it has released K1.4 million to the landowners through the Mineral Resource Authority. This was the message given to the Wild Dog Mining Area Landowners Association by company representatives when they met at the mine entrance last Friday which was witnessed by police officers. However, the company representatives were not allowed to enter the gate and a request to check on company properties and assets at the mine site were turned down by the landowners. The locals said they would continue with the current arrangement until all their grievances were looked at. The landowners occupied the mine site since last week after forcing out NGG workers and management and they will only allow the company to resume work if all their demands were met. Police personnel remained at the mine site to take care of company assets and properties. The landowners had demanded NGG to pay their outstanding royalty payment of K3 million as well as K700m as compensation for the damage done to their land and environment and for infrastructure development such as roads, schools, electricity and water supply in the seven surrounding Baining villages. Attempts again to talk to the company management were unsuccessful. They said the only person who could release any information on the current situation was New Guinea Gold Limited chief executive officer Wayne Johnston who was based in Australia. Attempts have been made to get comments from him. The mine is located in the Sinivit Local Level Government area in the Pomio District. Mine production started in 2008 with the first exploration works carried out in the 1980s. THE Panguna Landowners Association is supporting the government of Peter O’Neill, reports The National newspaper. Association deputy chairman Michael Pariu, who is the chairman of its business arm, Road Mining Tailings and Leases Ltd (RMTL), has decided to break his silence to voice official support for the O’Neill regime. Pariu said the association was ready to stand behind the government because “it is a genuine and people’s government which is prepared to be pro-active on many important issues affecting Papua New Guinea and Bougainville today, especially in combating corruption”. “The people of Panguna commend this government for tackling this problem head-on and which the former Somare-led government had for a long time failed to address in an effective and honest way,” he said. Pariu called on the government to support the association with funding for Panguna landowners to organise themselves in preparation for the re-opening of the Panguna mine. On the Panguna mine and extension of licence, Pariu said the association urged the government not to renew the mining licence to Bougainville Copper Ltd.
“The ownership of any licence over the mine must now go back and remain with the landowners. The landowners are the rightful owners of the resources”. In relation to the 2012 general election, Pariu said Panguna landowners were already seriously thinking about selecting and nominating their own candidate who would contest the Central Bougainville seat on an association ticket. The seat is held by Minister for Communication Jim Mi­ringtoro. “We want our own man, a landowner himself from Panguna with appropriate lea­dership qualities who understands our issues to represent Central Bougainville in the national parliament this time. “We have had enough of being misrepresented and lied to in the past by leaders who pretend to understand our problems and issues. Enough is enough. We cannot take it anymore,” Pariu said. I met up with one of the lawyers who was involved in the case. He was family and it was Christmas Eve. I smiled. “Congratulations on the win, bro!”. He smiled back. He probably knew it took a lot out of me to say that, and that there was a hint of insincerity in my voice. The decision had left me gutted. I’ve been in Papua New Guinea’s development circles since I was 14 and though I’m not as naive as I used to be about issues affecting development in PNG, I still wear my heart on my sleeve when it comes to grave social and environmental issues affecting my nation. The Supreme Court of Papua New Guinea had decided 2-1 that it was quite alright for Chinese state owned Ramu NiCo Mine to dump mine waste in the sea of Madang, boasted the world over as Papua New Guinea’s most beautiful Province. I went to Madang this year, and I spent a month with Papua New Guineans (and non-Papua New Guineans) in the frontline of a war against humanity; a war waged by greed and convinience and the dehumanization of a People who are as old as the ancient sea that binds them. This is the sea where the Chinese will dump Millions of tonnes of Mining waste a year. The Chinese will do this because it is convenient and it is cheap. They will do this because it is economical. The Government of Papua New Guinea will allow this because if it does not, the Chinese will sue Papua New Guinea for breach of contract. This lay heavy on Justice Canning’s mind when he handed down the first Medaing vs MCC decision at the National Court in Madang. The decision was a public policy decision. Cannings J had found that there was a cause in the tort of Nuisance for Louise Medaing anf the 1083 other plaintiffs. But Cannings ruled that to give effect to a permanent injunction preventing the operation of the dumping system would affect Chinese and Papua New Guinean economic interests, and therefore he permitted the Chinese to dump mining waste into Paradise. The Supreme Court found that there was no Nuisance; the apprehension of nuisance is not nuisance. “ln the grounds of cross appeal, the cross apellants contend that the trial Judge erred in making declaratory orders that causes of action in private and public nuisance had been established when the cross-respondents’ complaints concerned causes of action that might or might not arise in the future. lt was not alleged by the cross respondents that there had been any discharge of tailings or mine waste through the DSTP. If you light a match and touch with your fingertip the lit match you will be burnt. No hypotheses allowed. You can’t theorize being burnt. You must be burnt. That is the only way the law will recognize that fingertips on fire is not a good idea. The Supreme Court ruled that nuisance could have only been actionable if actual dumping was taking place. And with that the case was lost. “It’s a development in the law of nuisance, bro”… the lawyer told me. I smiled a bit. I had to. It was true. Papua New Guinea’s own law of nuisance was undeveloped. There is no doubt Medaing v MCC will be studied by Law of Torts students in UPNG under the topic of Nuisance. It is perhaps the biggest Nuisance case in our jurisdiction. After a while the smiling faded. Legal Scholarship aside, there was nothing exciting about the ruling. I read Martyn Namorong’s hear-felt letter to the future generations of children in Basamuk and the wider Raikos and I felt my spirit break. The letter to me back to an encounter with one of the plaintiffs alongside Louise Medaing – a man named Terry. I met Terry on the last day of my trip to Madang. I shook his hand and he thanked me for supporting his cause. I looked in Terry’s eyes and his face; I saw a story no amount of ambiguity in his words could disguise. This was a man – an old man – who was fighting a tough battle, and I knew that he knew that failure was not an option for him. I remember later that night after the encounter I wrote a poem about Terry. Rivo was being whipped with hard rain and a grand Electrical Storm, and the weather, somehow, found its way into the poetry. I have since lost the poem but as I remember it now, the poem was about a man preparing to spill blood to keep heaven on Earth. The poem was not about Terry but in some way it was indeed about the old man from Basamuk. After the Supreme Court’s session, I set out to track a copy of the judgement. I found it at the Mine Watch blog and read it into the early hours of the morning. The next day I woke up feeling a way I vowed I would never feel again. I felt defeated and disillusioned. The newspapers presented the story on a positive note. I passed on the paper to village boys who were trying to roll sticks of tobacco with it. It feels like Genocide – State-sanctioned Genocide! The communities of Basamuk depend on the seas for their livelihood. They have been since time immemorial. The sea carries in it the hopes and fears of the People of Basamuk. If you kill the sea, you kill a way of life; you take away the dignity of a proud people – people like Terry and Louise. The State won the case, but the State actually lost. The State of Papua New Guinea failed its People. A friend in a radical NGO told me they were preparing amendments to the Environment Act to help the people of Basamuk. It’s December 2011. Tis the season to be jolly they say. Tis the season to over-ride the Supreme Court. The O’Neill/Namah Administration has demonstrated this talent by amending the Prime Minister and NEC Act 2002, and by doing so, effectively becoming the legitimate Government of Papua New Guinea just moments before the Supreme Court handed down its decision against legitimacy of the O’Neill Administration. Indonesian investigators say some of the anti-mining protesters attacked by police on the island of Sumbawa were lying down when they were shot, reports ABC radio. Investigators from Indonesia’s Human Rights Commission (HRC) have been sent to the island’s port town of Sape to find out why police opened fire on protesters opposed to mineral exploration being conducted by Sydney-based company Arc Exploration. They say some of the victims were lying on the ground when they were shot, while others were running away. Three protesters were killed in the violence on Saturday. Some protesters have admitted possessing weapons like knives and spears, but there is so far no evidence any of them used their weapons against police who were armed with modern assault rifles. Arc Exploration has suspended its search for gold in the region until the situation is resolved. Arc has been locked in a long dispute with anti-mining activists and local farmers, who were calling on the government to revoke its large exploration lease when the riot police moved in on the weekend. A statement from Arc says that in conjunction with local government, the company has conducted extensive consultation concerning its activities. It says it recently received positive responses from the local communities and authorities. But Indonesia’s HRC chairman Ifdhal Kasim says the recent deaths have shown those assurances were ill-founded. “I think this is not true because in fact many people in this area, people in three districts, still oppose this corporation’s operation in this area,” he said. There has been no suggestion the company was involved in the violence.